Thousands of people a week are hearing about Primary the Ruling Class and many are getting involved. This could be your chance to actually do something for your country. Something you can be proud of. Something that sets an example so our children will learn the United States is something worth standing up for. IAMs hold the highest level of membership and are directly responsible for the organization’s accelerated growth. Therefore, PRC PAC is willing to pay significant reimbursement for successful efforts. 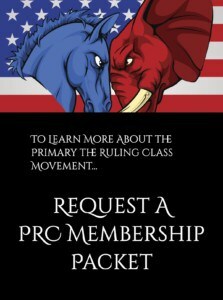 To learn more about what it means to be an Independent Affiliate Member of PRC PAC, go HERE. IPM status is for individuals that are less involved in spreading the word (recruiting) but want to be involved in the community decision making, news, and discussions. To learn more about what it means to be an Independent Affiliate Participating of PRC PAC, go HERE. If you have no interest in helping recruit but would like to support the movement, then this is for you. NADs can take part in polls that help PRC PAC determine strategic direction and issue priority. You may also receive a certificate of recognition and our newsletter. Become a NAD by making a purchase in the PRC Store or by making a donation. Donations of as little as $25 are accepted. Note: A Donation of $12,000 will qualify an individual as a Qualified IAM for Life, will carry the title ‘Lifetime Member,’ will receive a special recognition wall plaque, and have special seating at events. PRC PAC has need for the following skill sets. If you have these skills and are willing to donate a little time, please go HERE.